The most important part of building an online form is how you send your visitors to it. One option is to put the form directly in your website with a simple copy and paste! 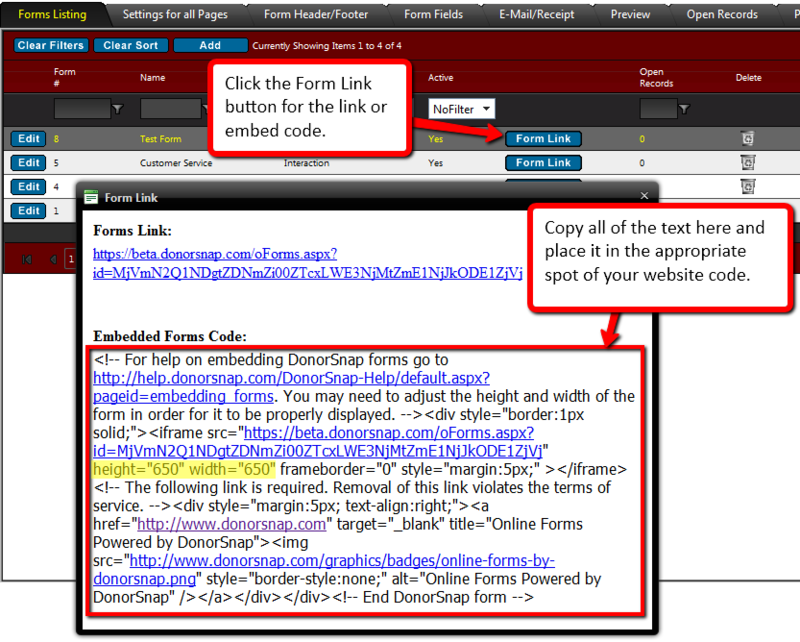 Once you have copied the Embedded Forms Code from the popup window, paste it in the html code of your website. The height and width values highlighted in the screenshot above are default values. You may find it useful to adjust these according to the design of your webpage. If you are comfortable with html and styles, you are free to modify this block of code further. Please note that all forms, both embedded and linked to, are secure and all submissions are encrypted. However, your visitors will not receive any notification or signal that the form is encrypted if it is embedded in your website other than your website’s existing security protocols such as https:// or SSL certificates. If you have concerns with this, you can alternatively use the form link to open a new page that will display the correct security measures that are in place.